The first time I heard Thich Nhat Hanh (Thay) in person was in 1990 at the Common Boundary conference in Crystal City, Virginia. The conference focused on the intersection of psychotherapy and spirituality and the audience for Thay’s keynote talk was primarily therapists. I was amazed by Thay’s capacity to project presence. Though he spoke slowly, in a soft voice, the several thousand of us in the auditorium were clearly drawn into his calm presence. People sat on the edge of their seats with a reverential silence. I was also amazed by Thay’s presentation. I had committed myself to Buddhist meditation about a year before, because it worked wonders for me, and I was used to teachers explaining the practice using the traditional Buddhist frameworks, such as the three Dharma Seals, the Four Noble Truths, the Eight-fold Path, and so on. Thay, however, at least in my memory, did not use any of Buddhist terms, not even the the words Buddha and Buddhist. He simply explained in concrete detail how we create suffering in our lives by how we live and the choices we make. He also made clear how we can reduce the suffering we cause for ourselves and others by regularly practicing mindful breathing and walking, and by becoming more aware of our interior lives and the world around us. Thay’s keynote speech came to mind recently after watching “Won’t You Be My Neighbor,” a documentary about the life and work of Fred Rogers. Rogers career started in the 1950s in mainstream television, but after a few years, appalled by the meanness of children’s television programming, he redirected his life to offering children something more nourishing. During his early years of producing shows for children, he also clarified his understanding by studying child developing and theology and becoming an ordained Presbyterian minister. 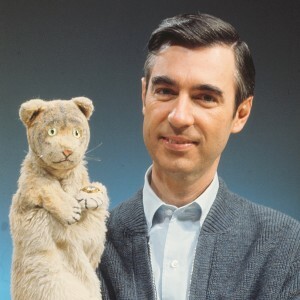 Like Thay, Fred Rogers had a quiet yet magnetic presence, and he taught the core values of his spiritual tradition, love and acceptance, without ever using the words God or Christian. This Thursday evening, after our guided meditation and walking meditation, we will watch four short videos from interviews with Fred Rogers and from Mr. Rogers’ Neighborhood. In Little Consumers, from an interview made in 1967, before Mr. Rogers’ Neighborhood shows appeared on the air, Rogers talks about children needing to be accepted as they are in order to develop, and about mass media’s effort to turn them into consumers as soon as possible. For me, one of the most tender life lessons from Mr. Rogers’ Neighborhood is a duet in which Daniel Striped Tiger (voiced by Mr. Rogers) expresses his fears about self-worth and fitting in, and Lady Aberlin expresses her unconditional acceptance of and love of him. True to life, Daniel Striped Tiger seems soothed, but not yet convinced. The final short video is Fred Rogers’ 1969 testimony before a senate panel. Roger’s sincerity and his vision for children’s television seem to melt the heart of a senator predisposed to cutting funding for public television. We will begin our Dharma sharing exploring what we have learned from Thay and mindfulness practice, from Mr. Rogers, and from others, about fully accepting all we experience and all we are. Below is a excerpt on self understanding and self love from Thich Nhat Hanh. The first step in loving communication is for you to go home to yourself. You take the royal way back to yourself through mindful breathing to touch the joy, the beauty, the wonders of life in and around you. The practice of being mindful of your breathing, your walking, your breakfast-making helps you go home to yourself in the here and now, to be mindful of what is going on in your body, your feelings and your perceptions, to recognize and transform your suffering. If anger is coming up, you become aware of your anger. If fear is coming up, you become aware of your fear. You are always there for yourself. “Good morning my little anger, I know you are there. I will take good care of you.” “Good afternoon, my fear, you just manifested. I know you are always there, you are my old friend. I will take time to care for you.” Then you practice walking mindfully, breathing mindfully, acknowledging the presence of your fear or your anger and soothing it. Self-understanding and self-love provide the foundation for understanding and loving another person. This is the first step: going home to ourselves, taking care of ourselves, understanding ourselves, accepting ourselves, and being compassionate to ourselves. The most precious gift you can make to your loved one is not money, power, or fame, but your true presence. To love means to be present for him. How can you love if you are not there? And the quality of your presence is very important. You have to be there, fresh, loving, understanding.